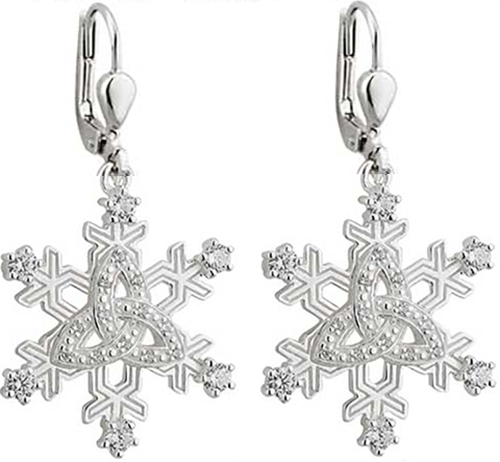 Celtic Christmas earrings are rhodium plated snowflakes that are enhanced with Trinity knots and crystals. 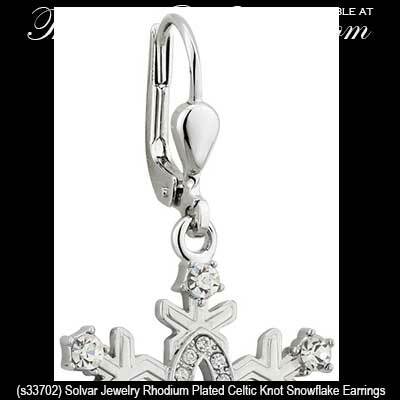 This Celtic snowflake jewelry like all the Irish made jewelry at The Irish Gift House is nickel free and hypoallergenic. These rhodium plated Celtic earrings are in the shape of snowflakes that feature superimposed Trinity knots that are enhanced with crystals. The Trinity snowflake drop earrings are on latching Eurowires and measure 5/8” wide x 1 3/8" tall, to the top of the wire. The Irish Christmas earrings are made by Solvar Jewelry in Dublin, Ireland and are gift boxed with a Celtic knot history card, complements of The Irish Gift House. Celtic snowflake brooch is a plated design that features the Trinity knot along with sparkling crystals. 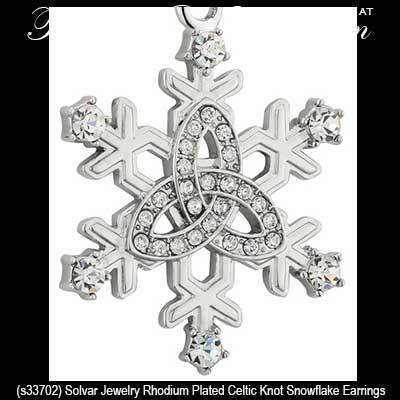 Celtic snowflake pendant is a rhodium plated design that features the Trinity knot along with sparkling crystals. Celtic bangle is a rhodium plated expandable bracelet with a Trinity snowflake charm.